Two and a half years after the release of the album ”Moonbathers”, Dutch symphonic metal band gives us a special release featuring new studio tracks as well as live material. Delain is symphonic metal that musically lives somewhere between Epica and Amaranthe with some Nightwish touches here and there. Catchy, modern melodic metal topped by the very fitting voice of Charlotte Wessels. “Hunter’s Moon” consists of four new terrific studio tracks plus a ten-track live recording and a Blu-ray featuring a live concert filmed in Utrecht, The Netherlands. The four new studio tracks are all top-notch Delain compositions. “Masters of Destiny”, “Hunter’s Moon”, “This Silence is Mine” and “Art Kills” are all great songs giving us what we love about Delain: bombastic, melodic, symphonic, catchy yet heavy with good guitar riffs and plentiful of keyboards. The ten live tracks are splendid: a Delain in fine form and supported by a loyal home crowd. Nightwish’s Marco Hietala appears as a guest and takes the music up a notch or two. Of the live tracks, “Your Body Is A Battleground” is a clear favourite of mine while “Nothing Left” is sheer brilliance. I hope Hietala will continue to collaborate with Delain as it is such a great combination. The live set closes with a great version of “The Gathering”. Delain’s “Hunter’s Moon” will be released by Napalm Records on 22nd February. Swedish doom masters Candlemass have reunited with original singer Johan Längqvist to create a fabulous new album that by far beats expectations. Candlemass, one of the best and most important heavy metal bands to come out of Sweden, is back with “The Door to Doom”, its twelfth studio album. Johan Längqvist was part of the original Candlemass line-up. He sang on the band’s 1986 debut album “Epicus Doomicus Metallicus” but departed shortly thereafter. Last year he, at least to me, surprisingly was brought back into the band to replace Mats Levén who has sung for the band for the past six years. I have no idea where Längqvist has been hiding for the past three decades, but he’s back and he sounds fantastic! The rest of the band consists of its most classic line-up: Leif Edling on bass, Mats “Mappe” Björkman on rhythm guitar, Lars Johansson on lead guitar and Jan Lindh on drums. “The Door to Doom” is of course based on the trademark Candlemass doom metal, but it is also quite a varied album. We get several calm sections as well as some serious heaviness. On “Black Trinity” we get the good-old familiar Candlemass sound as a foundation, but then a chorus that is more contemporary and modern sounding. The mix of old and new works very well. On “Astorolus – The Great Octopus”, Black Sabbath’s Tony Iommi provides a guest guitar solo which takes a great song to an even higher level. “The Omega Circle” is stunning and showcases that Johan Längqvist is indeed a fabulous vocalist. The beautiful slow piece “Bridge of the Blind” is my favourite track on this eight-track album which does not have a weak moment. This album is solid straight through. Perhaps it is the impact of Längqvist’s return or something else, but to me it seems that Candlemass has got renewed energy. Their new music is terrific and the band has risen once again. This is so good it hurts. Epicus Doorus Doomicus Fantasticus! Candlemass’ new album “The Door to Doom” will be released on 22nd February via Napalm Records. Swedish rockers Skraeckoedlan are back with their third album. It’s a wonderful mix of fuzz, stoner and progressive rock. One of Sweden’s best bands right now. “Eorþe” is Skraeckoedlan’s third studio album since they were founded in Sweden in 2009. The Swedish rockers’ music smells of 1970s rock. Stoner rock? Yes, there are bits of that and fuzz rock parts. There are psychedelic echoes and plenty of tasty progressive rock influences on this album. But while the basic sound is based somewhere in a distant yesteryear, this is no retro act. Skraeckoedlan manages to sound modern and relevant here and now. Most of all, they have established a signature sound that’s fabulous, groovy and bloody great. There are of course American influences here, but there are also hints of Swedish 70s bands such as Solid Ground and November. Skraeckoedlan’s songs have lyrics written in the band’s native Swedish. They’re a spectacular mix of fantasy, mythology and nature. The combination of the music, the lyrical themes and the band’s image, makes this an awesome band. “Tentakler & Betar” is one of the standout tracks on an overall even and terrific album full of great riffs and melodies. “Kung Mammut” with its many twists and turns is another favourite of mine. Sweden has a proud tradition of giving birth to great rock bands. Among the best of the current Swedish bands are no doubt Skraeckoedlan. If you haven’t yet discovered this great band, now is the time to do so. This is a fantastic album from a terrific and quite unique band. Skraeckoedlan’s album “Eorþe” is out now via Fuzzorama Records. Tobias Sammet’s Avantasia returns with a terrific album taking us back into a wonderful fantasy world of rock opera-meets-metal musical. Edguy’s Tobias Sammet started Avantasia as a side project in 1999. It was planned as a one-off project, but it grew and got a life of its own with albums and live performances and a star-studded line-up of guest musicians. “Moonglow” is the eighth studio album by Avantasia. Guest vocalists appearing on the new “Moonglow” album are Ronnie Atkins (Pretty Maids), Bob Catley (Magnum), Michael Kiske (Helloween), Candace Night (Blackmore’s Night), Mille Petrozza (Kreator), Geoff Tate (ex-Queensrÿche), Jorn Lande (ex-Masterplan), Hansi Kürsch (Blind Guardian) and Eric Martin (Mr. BIG). Avantasia is a fantasy world and the “Moonglow” album is the latest chapter in this rock opera-meets-metal musical. There are terrific melodies, guitars and plenty of drama. Musically, Avantasia lives, as expected, somewhere between power metal, melodic rock and what you can hear at a modern West End musical in London. It works a treat. The track “Book of Shallows” is a bit faster and heavier than most other songs and it is also one of my favourite tracks on this stunning album. “The Raven Child” is a beautiful song. “Alchemy” is a splendid rocker on which Geoff Tate gets to shine. He hasn’t sounded this good for many years. Avantasia is escapism and I love this fantasy world of rock we get to experience on “Moonglow”. The soundscape on this album is massive, with plenty of twists and turns, and the fabulous production really helps to shape this album into something special. Avantasia’s music puts a smile on my face. It’s bombastic in a good way. The album includes a cover, “Maniac” from the “Flashdance” film soundtrack. It’s a bit of a strange choice of a song that is the album’s weakest point. With so much great original music, I don’t know why Sammet decided to include a cover song. But don’t let that distract you from the other fantastic music Avantasia gives us on this album. Tobias Sammet’s Avantasia “Moonglow” is out today via Nuclear Blast internationally and Ward Records in Japan. 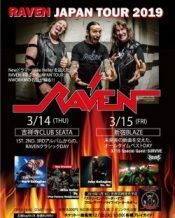 Avantasia will perform live in Tokyo on 9th May. 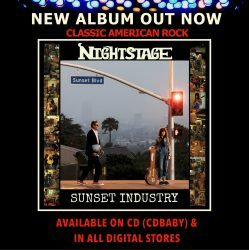 Sweden’s Lugnet is back with “Nightwalker”, a very tasty rocker of an album full of 70s hard rock vibes. Sweden keeps delivering bands who are here and now, but who are paying their respects to the hard rock bands of the 1970s. Lugnet is one of the best ones. The 70s retro sound is there (crossbreed Deep Purple with Black Sabbath and add a pinch of early Whitesnake and you’ll be close), but this is much more than just that. The band has some fantastic songs, such as “Die For You”, “Begging”, “Never Again” and the title track “Nightwalker”. This is the band’s second album, following the 2016 debut album. New vocalist Johan Fahlberg is a great addition who is also the current singer of German band Jaded Heart. Another notable band member is drummer Fredrik Jansson who is also a member of Angel Witch. The blues-rock influences on this album are obvious and it comes as no surprise that guitarist Matti Norlin and bassist Lennart Zethzon are also members of Swedish blues-rock band Badge. The current Lugnet line-up is completed by guitarist Marcus Holten. The track “Cockroach” is one of the best on the album and it has a Glenn Hughes feeling – think a hard rock version of Trapeze. Very tasty music. This is a fabulous album that oozes retro vibes but without being a tribute band. This is fantastic new music based on an established 70s rock sound. Bloody awesome! Music to get laid to. Lugnet’s album “Nightwalker” is out now via Pride & Joy Music. Sweden’s Devil’s Gun returns with a new album filled with classic-sounding heavy metal. Sweden has a long tradition of producing great metal bands in pretty much all metal sub-genres. In recent years, many Swedish bands with a sound based on classic 70s and 80s heavy metal have emerged. Among them is Devil’s Gun. The band released its first full-length studio album “Dirty ‘N’ Damned” in 2016 and now the follow-up album is ready. Devil’s Gun plays heavy metal of the good old classic kind. There are many echoes of the classic Accept sound here, the way they sounded in the 80s. Joakim Hermansson’s vocal style seems to be heavily inspired by Udo Dirkschneider, the legendary former Accept frontman. Genre-wise there is nothing new here. But that’s perfectly OK. This is a shout-out to the 80s metal that many of us grew up with and it is executed well. While the style is clearly 80s heavy metal, this is no tribute band or mere copycat. This is great new music built on a foundation of 80s metal. There are a lot of Accept vibes here, but there are also some echoes of American 80s bands such as Mötley Crüe and W.A.S.P. on songs such as “Queen of Destruction” and on some songs, such as “Bad To The Bone”, we get a bit of a Judas Priest vibe. We also get a few nods to AC/DC here and there. The lyrics are classic metal: “Killer Machine”, “To The Devil”, “Tear Down The Wall”, “Lights Out”, “Electrical Shock”, “On The Road” and so on. Only the interestingly named song “Alligator Fuckhouse” stands out from the standard heavy metal formula. Metalheads – it is time to stretch your necks because when this album is released, it’ll be headbanging time! Now I just need to find my old air guitar and dust it off. Love it! Devil’s Gun’s album “Sing For The Chaos” will be released on 12th April via Black Lodge Records. Toto has been around since the 1970s and on the band’s new live release they show us that they have still got it after four decades of touring. American rock band Toto has a reputation as a band made up of professional session players who wanted an outlet for their own music. A band of musicians loved by other musicians. Despite a bit of a revolving door when it comes to band line-ups over the years, Toto is always a band of pros. Toto always delivers. Guitarist Steve Lukather has been part of the Toto journey since the beginning and co-founder Steve Porcaro (keyboards) is also there, although he has come and gone a few times over the years. Vocalist Joseph Williams, who originally sang for Toto in the 80s, is back behind the microphone and they have a great touring band in place. Toto’s new live release, “40 Tours Around The Sun”, recorded during the band’s European tour in 2018, is being offered in multiple audio and film formats. It’s a terrific show they put on. As always, Toto gives us pop and rock with some funk, some soul, a pinch of jazz, some world music, a bit of prog and so on. We get many different musical influences in what essentially boils down to slick soft rock. The instrumental “Dune (Desert Theme)” is a majestic piece of music and one of the highlights for me on this new live release. We obviously get the hits “Africa”, “Hold the Line” and “Stop Loving You”. But we get much more than that. From the band’s self-titled debut album from 1978, we get “Hold the Line”, “Angela” and “Girl Goodbye”, and we also get many more great songs from throughout the band’s career. Steve Lukather’s guitar on “While My Guitar Gently Weeps” is phenomenal. On songs such as “Make Believe” and “Rosanna”, with full-blown instrumentation with saxophone, keyboards and everything, Toto is in its element. These slick musicians are indeed world-class but they also have a feeling for how to put all the parts together. On “No Love” we get saxophone player Warren Ham delivering some tasty music on a harmonica which turns into one of the best moments on this release. “Africa” is also delivered to us in a jam-tastic version. Toto’s “40 Tours Around The Sun” is out now via Ward Records in Japan. Toto will perform eight shows in Japan between 14th and 27th February. Swedish band We Are The Catalyst gives us modern and catchy metal with pop melodies on its third album. Formed in 2012, Swedish band We Are The Catalyst has already had some initial success with tours in the UK and China and well-received record releases. An EP release in 2013 was followed by the band’s debut full-length studio album, “Monuments”, in 2014 and a second album, “Elevation”, in 2016. Band members Cat Fey (vocals), Kenny Boufadene (guitar and vocals), Joni Kaartinen (bass) and Håkan Strind (drums) have previously played together in the band One Without. Now they’re back with the rather catchy “Ephemeral”, their third album featuring twelve shiny new tracks. We get very modern-sounding melodic metal combining plenty of keyboards with guitar riffs and heavy drums. It’s the sort of contemporary blend of metal and pop that narrow-minded listeners often brush off as “not metal and so I can’t listen to it”. For those of us who are a bit more curious and open-minded, we can discover some good new music on “Ephemeral”. We Are The Catalyst is the kind of band that has a chance of making it big as they can potentially appeal to a much larger mainstream audience than more “pure” metal acts. The band lives in that contemporary Swedish musical world that houses diverse acts such as Smash Into Pieces, Amaranthe, CyHra, In Flames, Ghost and much more. It is a world where fitting into a specific genre is secondary to creating modern melodic music. As much as I love my old-school metal stuff that fits within certain limits, it is refreshing to hear some of these newer acts focus on creating music and not worrying about being “true” or anxious about fitting in. The focus here is on writing great melodic songs that are then performed in an appealing fashion of back and forth between pop and in-your-face metal riffing. Some of the songs are built up in a similar way to the classic hard rock power ballads of the 1980s where a song continuously builds up to reach a crescendo and then is brought down to start over again. It works very well. The voice of Cat Fey is a great fit for this music – or perhaps the music was written to fit in with her vocals. Either way, the combination works well. The album opens with what sounds like a bit of a Lacuna Coil-flavoured catchy pop/metal song called “Over Pale Waters”. It’s a potential radio hit. It sets the tone for the album which continues in a similar fashion throughout. “Innan Allt Faller”, one of the album’s best songs, is sung in the band’s native Swedish, whereas the album’s other songs all have English lyrics. “Alone Against The World” is another track that will work well in the band’s live show. The album closes with what is my favourite track, the dreamy “Dust”. This is a promising band that we all should keep an eye on. They have another UK tour this month and, hopefully, they will keep touring as that is the way that this band will go to the next level. We Are The Catalyst’s album “Ephemeral” will be released on 13th February. King Diamond returns with a glorious live release of his best music and plenty of horror-themed theatrics. If you like your metal filled with haunted drama and horror-themed theatrics, King Diamond is where it’s at. This career-spanning live release is flawless, a real feast for King devotees. King Diamond has always been about combining theatrics and drama with splendid music – putting on a great show while performing great music. On “Songs For The Dead Live” we get just that. Behind the make-up, imagery and all the stage props, there is indeed excellent music. It’s heavy metal, with many haunting atmospheric parts and some progressive influences. On this release, we get two almost identical sets: one recorded live at The Fillmore in Philadelphia in 2015 and one at the outdoor Graspop festival in 2016. As expected, we get a splendid show by the veteran Danish singer and his band. The setlist is superb. We get all the good stuff we could possibly hope for, including “Welcome Home”, “Sleepless Nights”, “Eye of the Witch” and “Halloween”. In addition to King classics, we get a nod to his past with the fantastic Mercyful Fate songs “Melissa” and “Come to the Sabbath”. We also get to hear King’s album “Abigail” from 1987 performed in its entirety. What a treat! King’s voice is in fine form and he delivers his characteristic falsetto singing better than ever before. But his vocal range is extensive and we get the full range here. The band is rock solid and features three Swedes: guitarists Andy LaRocque (Swedish Erotica, Death, E.F. Band) and Mike Wead (Mercyful Fate, Hexenhaus, Candlemass, Memento Mori, Abstrakt Algebra) and bassist Pontus Egberg (Treat, Lion’s Share, The Poodles, Zan Clan). American drummer Matt Thompson (Shaolin Death Squad, Legacy of Disorder) completes the line-up. The newest addition is Egberg who has brought some serious groove to King’s rhythm section in recent years. King Diamond’s “Songs For The Dead Live” is out now via Metal Blade Records. The Japanese edition, consisting of 2 DVDs of the two shows and a CD with the audio from the Philadelphia show, will be released in Japan on 27th February via Ward Records.